Many of you have used the brain break activities that we have here on the OT Toolbox help kids focus and pay attention in the classroom environment. Movement in the classroom is helpful for learning and helping kids with movement needs such as fidgeting or attention. 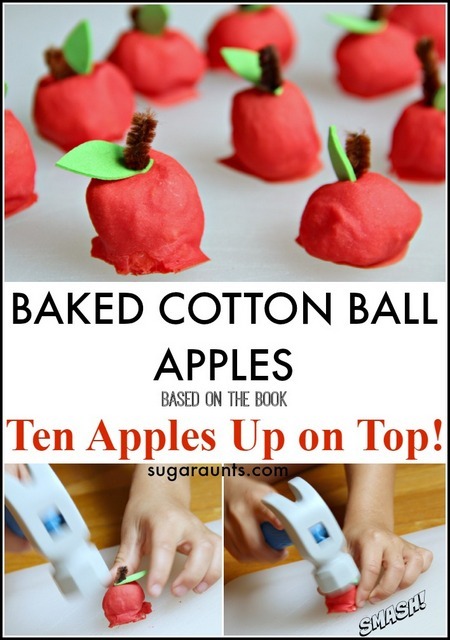 The brain break activities listed below can go along really nicely with an apple theme. Try adding the Apple themed brain breaks in between activities, lessons, and other classroom tasks. Apple themed brain breaks can be a great way for kids to extend on an Apple theme while adding movement into the classroom. 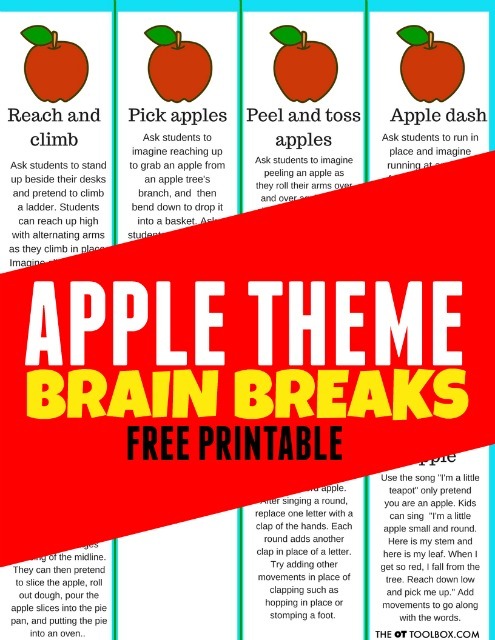 Here are some apple think brain break activities that can be used at movement into the classroom using an Apple theme. 1.) Reach and climb- Ask students to stand up beside their desks and pretend to climb a ladder. Students can reach up high with alternating arms as they climb in place. Imagine climbing up a ladder to reach the top of an apple tree. 2.) Pick apples- Ask students to imagine reaching up to grab an apple from an apple tree's branch, and then bend down to drop it into a basket. Ask students to repeat this motion repetitively reaching up high and then bending down low to the ground. 3.) Peel and toss apples- Ask students to imagine peeling an apple as they roll their arms over and over again at the elbows. Then ask them to toss an imaginary apple into a bucket. They can imagine the buckets are at different levels and distances as they pretend tossing apples. Continue this exercise for one minute. 4.) Apple dash – Ask students to run in place and imagine running at an apple farm. Students can pretend they are delivering bushels of apple from a tree to a barn as they run in place while carrying an imaginary bucket. Ask them to imagine hopping over logs or running faster or slower. 5.) 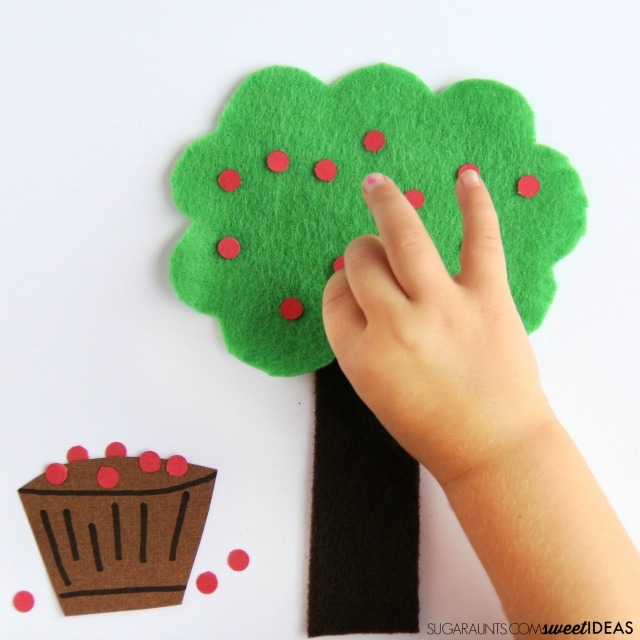 Make a pie- Ask students to imagine picking an apple and buffing it with their sleeve. Ask them to buff an apple on their left sleeve and then their right sleeve. Doing this activity encourages crossing of the midline. They can then pretend to slice the apple, roll out dough, pour the apple slices into the pie pan, and putting the pie into an oven. 6.) Apple spell- Ask students to form the letters used to spell the word "apple" using their arms and legs. To make an "A", the student can reach up over their head putting their hands in the middle and stretching their legs wide next. Next, make a "P" by standing with feet together and arms curved toward the side to create the bump of the letter. Complete the same movement again for the second P in the word apple. Next, form a letter L using by sitting on the floor and bending at the waist stretching legs out straight. Finally, create a letter E by sitting on the floor bent at the waist with leg s extended straight and feet together. Put one arm out at the waist and reach the other arm out overhead bent at the elbow. 7.) Spell and clap- To the tune of "BINGO", spell the word apple. After singing a round, replace one letter with a clap of the hands. Each round adds another clap in place of a letter. Try adding other movements in place of clapping such as hopping in place or stomping a foot. 8.) I'm a Little Apple- Use the song "I'm a little teapot" only pretend you are an apple. Kids can sing "I'm a little apple small and round. Here is my stem and here is my leaf. When I get so red, I fall from the tree. Reach down low and pick me up." Add movements to go along with the words. Can you think of any other apple themed brain breaks? 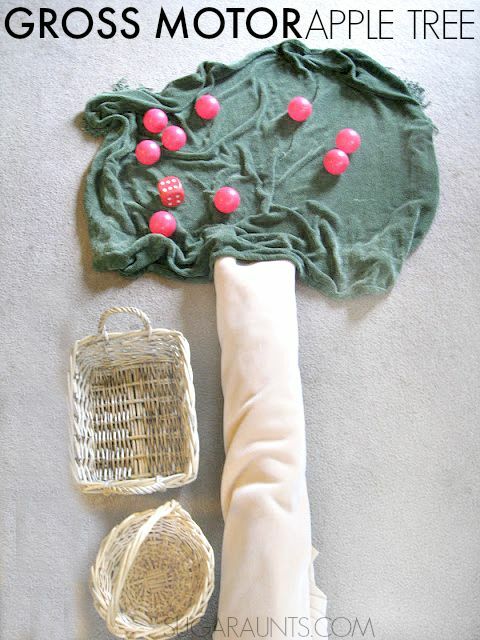 Squirrel Themed Brain Breaks may be another fun movement idea that you are looking to pair with a book. 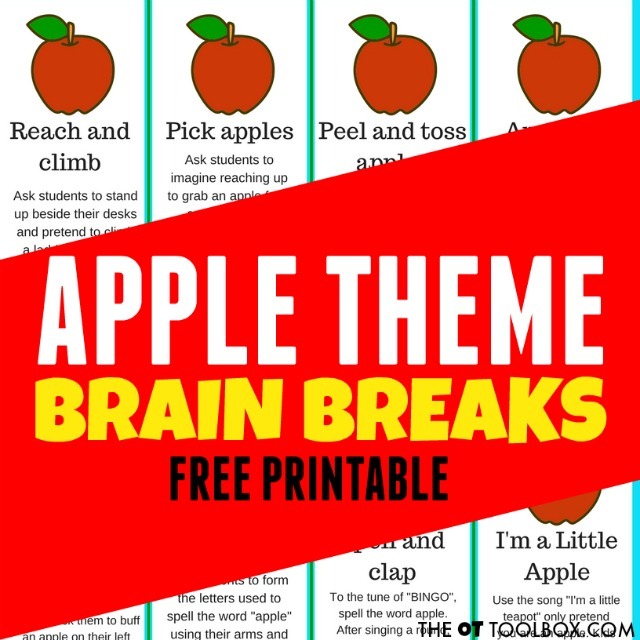 Get this list of apple themed brain breaks as a printable sheet to use in the classroom. Print them off, glue them to cardstock or index cards and laminate for durability. Kids can complete apple brain breaks as a group or individually. Get the free printable sheet HERE. 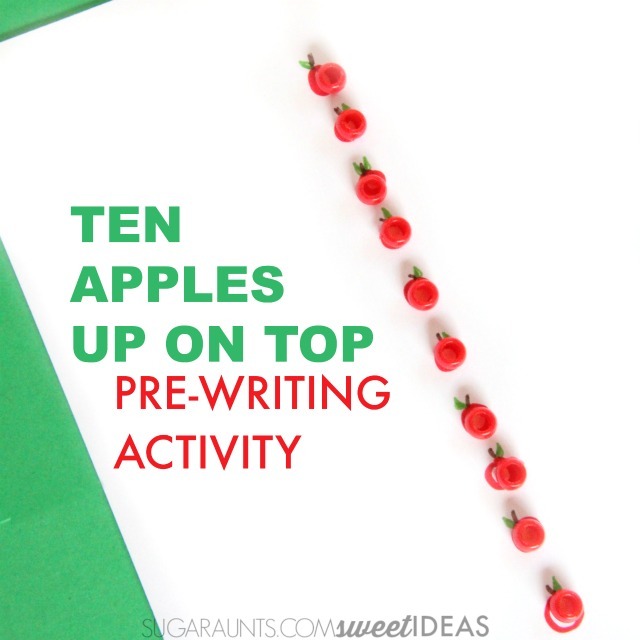 You will love these apple activities to go along with an apple theme.